I’ve colored my second-to-last monster from the Cthulhu Coloring Book (though there’s also one bonus zombie left)! 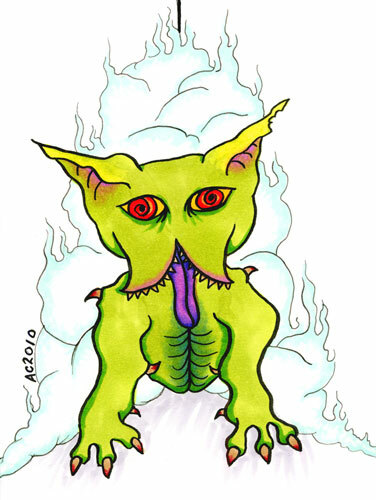 This is the Hound of Tindalos, a Lovecraft creation who is said to stalk time travelers like a hound once it gets their scent. He can appear anywhere there is an angle of less than 120 degrees, and here he’s slipping out of a corner to play fetch with you! Clearly you would never do something so naughty as to time travel, so you have nothing to fear from this gruesomely cute beast. If you play Arkham Horror, you already know about this guy — he’s always one of the monsters that gets an unhappy groan when he appears out of the monster cup in our group. Weeble Hound of Tindalos, 5″x7″ pen & ink and Copic markers on watercolor paper.